Located at the base of the Rocky Mountains, Denver, Colorado is one of America's most beautiful cities. Founded in 1859 as a gold mining camp, Denver is one of the nation's youngest cities, and one of the most exciting. The city is very much alive with a great affinity for the outdoors and you are promised to get your fill with Denver's 300 days of sunshine a year. Denver, Colorado is a growing metropolis with a population of 2.4 million people and is the largest city in a 600-mile radius. Also known as the "Mile High City", Denver is one of the fastest growing cities in America and entertains over 8.8 million visitors a year. When you think of Denver, Colorado you think of skiing deep powder in the Rocky Mountains. The ski season runs nearly half the year, from mid-November to mid-April, when a rush of visitors flock to Colorado's numerous ski resorts easily accessible from Denver and its international airport. Denver has the tenth largest downtown in the United States, a bustling area centered around a mile-long pedestrian promenade that is lined with cafes. Down every street there are mountain views, a mountain panorama of 120 miles long and includes nearly 200 named peaks. Downtown Denver is home to three new sports stadiums, 300 restaurants, a restored historic district filled with 90 bars and brewpubs, a collection of museums, a variety of galleries and shopping, the second largest performing arts center in the nation, three college campuses and even a unique downtown amusement park. 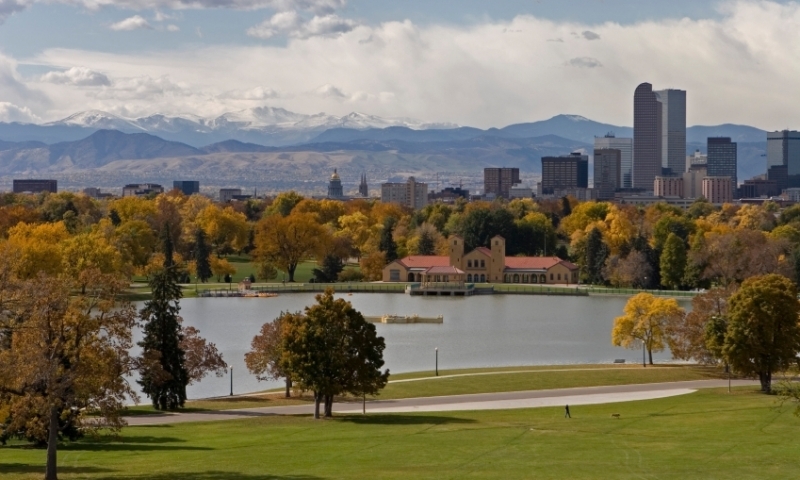 Denver has the nation's largest city park system, with more than 200 parks within city limits and 20,000 acres of parks in the nearby mountains. The abundant outdoor opportunity is overwhelming and would please the most avid outdoor enthusiast. Highly regarded for its entertainment, shopping, cultural attractions, and museums, Denver is also the sports and recreation capital of the vast Rocky Mountain West. The word has spread that Denver offers a great quality of life with its endless opportunities for outdoor recreation, along with excellent education and career opportunities.